Has anyone ever built their way out of a housing bubble? The narrative across the real estate industry is we have a supply issue. However, a supply shortage is really just a symptom of an underlying disease, demand. The root cause is cheap and easy credit, this makes real estate attractive, hence influx of foreign capital, speculative behaviour, and over leveraged buyers. The result, demand explodes, everything sells, prices go up, banks lend more because prices can only go up, supply becomes extremely scarce as real estate becomes the most sought after asset. Sellers watch their equity increase every month and think why sell when I can make more next month. So sellers decide not to sell making it even harder for buyers now competing for the same scarce inventory, bidding wars, prices shoot up, a vicious cycle ensues. This is why prices shoot up 31% in 8 months in areas like Abbotsford and Mission where land is plentiful and supply has never historically been an issue. Langley townhouse supply hits a record high in May 2014. As of March, 2015 supply is still above normal levels. Hence why prices were completely flat over the previous 5 years. As the market starts to heat up, inventory drops almost instantly to record low levels. From March 2015 to December 2015 townhouse inventory falls 78%. Langley townhouse inventory falls 78% in 9 months. As a result of the low inventory, sales hit new record highs. Sales/actives ratios shoot through the roof, going from 38% in March to 77% in December. Anything above 20% is considered a sellers market, a sellers market on steroids. Next up, South Surrey condos. Realtors used to turn down listings because they were too hard to sell. Inventory levels as of May 2015 were at normal levels. In less than 2 years they hit record low levels. South Surrey condo inventory hits record lows despite plenty of supply one year ago. Richmond condo market had too much inventory a few years ago. As of July 2015 inventory levels were 24% above the 10 year average. As the market heated up inventory disappeared as sellers refused to sell in light of enormous equity gains over recent months. An excess of buyers compete for the historically low inventory, shooting prices up 25%. As of November 2016, inventory sits 51% below the 10 year average. Record low inventory levels from lack of supply? No. Record low inventory levels from an overheated market fuelled by cheap credit, and FOMO. So what’s the response. Don’t cure the disease but treat the symptoms of the disease. Build more. Richmond housing starts have been excessive over the last 3 years, setting record high housing starts in 2014, and 2015. 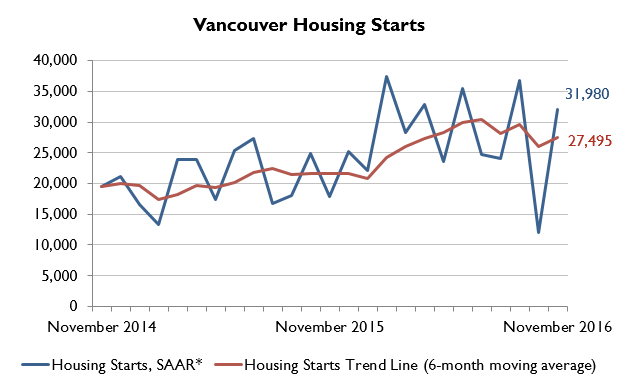 Langley also set record housing starts in 2015. Recent data from CMHC also shows Vancouver is on pace to build 27,495 units this year. With an estimated population growth of 30,000 per year that’s almost one unit per person. As per stats Canada the average household has 2.5 people. Next articleHow Much Impact Has the Foreign Buyers Tax Had?